Aircel the fast growing Pan India telecom operator in the country, today announced the launch of its GSM mobile services in Rajasthan telecom circle. With a subscriber base of over 45 million, Aircel, the fifth largest service provider, extended its services all across Rajasthan circle.This launch made Aircel as a pan India operator with its service in 23 circles. True to its word the simple value plan further offers STD @ 1p/1sec , Aircel to others @ 1p/ 2secs and Aircel to Aircel @ 1p/3secs. The validity is for a period of 90 days. To give maximum benefit to consumers, one can carry home tariffs while roaming on Aircel network across India for a period of 90 days from the date of activation. 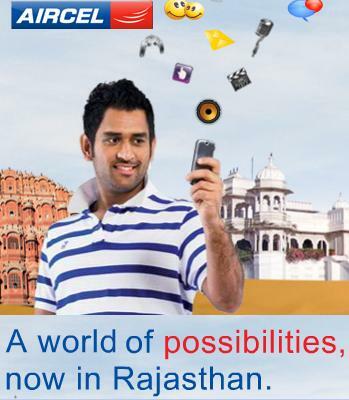 Aircel also announced a plethora of significant offers for its subscribers in Rajasthan. To address the needs of the consumers in Rajasthan Aircel introduced a Business Pack for the SME’s with unlimited community calling and Data @Rs.199 /Rs 499/Rs 999 for 1 month / 3 months/ 6 months respectively offering absolutely free local Aircel to Aircel calls & SMS and Aircel to others and STD @ 45p. Aircel announced the first PocketApps Store in association with Infosys this year and the same service can be availed by consumers in Rajasthan for a weekly charge of Rs. 7, one can download as many free applications as you want which could be from tracking your expenses, monitoring your fitness, scanning restaurant menus to reading newspapers in regional languages or even getting road directions. Aircel will also offer a rich bouquet of VAS services with localized content including a WAP Portal page for any GPRS handset. In addition to this, there will be Music on demand, CRBT and an innovative voice based Doctor-on-call service among others. aircel is not good service provider they change there plan without inform costumer it means they cheat costumer they lounched recharge or 42 free calling aircel to aircel 11pm to 6am for 30 days bt they change it im closing 15 connection of aircel in my family nd joining airtel ………………………………. Good plans,now net speed also increases…kabhii kabhi network challa jata hai.par wapis aa jata hai..the network should be like Vodafone and airtel..